I have always loved and cooked dishes numerous times as long as they are easy to prepare and tasty to eat! Cooking glutinous rice is one of those dishes. It is basically like a one-pot meal where you simple throw everything in, go and do your stuff and just come back when its about time to eat! 6) Then add a little soya sauce, dark soya sauce. No need sugar as the gravy from the peanuts is sweet already. 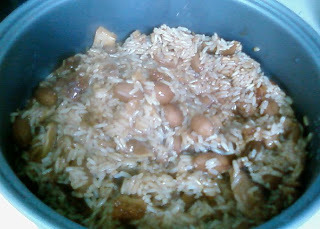 7) Then after frying it up, you transfer into the rice cooker. The traditional method is to steam it, but I prefer the simple method where I don't have to worry about the water drying up in my wok. 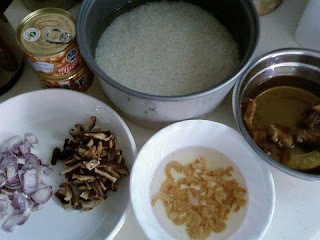 8) Cover the rice with water from the dried mushrooms and shrimps. Use the same amount of water you use to cook normal rice. 9) It should take about 30-40 mins to cook. 10) Finally you can garnish with fried shallots and spring onions. - you can add slice pork belly or chinese sausage in as well. Throw it after you fry your shallots. My whole family all love this simple and tasty meal!